I signed up for Talk Talk's simply broadband package a few weeks ago and the installation was done last wednesday. On the date of installation I managed to get a speed of approximately 7 mbps and though it wasnt fast like virgin I still was satisfied with it as most of my work involves just browsing the net and occassionally watching a video on youtube (low res ones not HD as it wont stream continously in this connection). Anyway from Friday last week I noticed a steady drop in connection and started getting average speeds between 2 to 3 mbs. Still I felt it might have been due to weekend with lots of folks just logging onto the net and downloading stuff and hence reduction in speeds. Anyway this slow speed contiinued over till Monday and I started getting worried as even browsing websites started getting slow. Finally I called talk on Tuesday. The person on phone gave the usual suggestions of restarting the router, disconnecting the cable which I did but not much effect as speed continued to be at 2 mbps and during peak hours (4pm to 10pm) it went down further to like .7mbps at times! I checked at ookla's speedtest site and it showed .7mbs to 1mbps during peak hourse. I then tried resetting the router to no avail. Yesterday I called them again and guess what I was asked to do the same 'tests' such as switching off the router, restartijng my pc,. I was then transferred to the 'technical team' and guess what suggestion they gave? They asked me to open the telephone connector box [the one installed by bt] as they wanted to check something. I refused as its not my job and there is a risk of some shock plus I am under the impression we are not supposed to open this box as its supposed to be bt's responsibiltiy. Anyway I refused to do what they suggested and then guess what they said they will need to send a bt engineer to 'check' the line is ok and the next 'earliest' appointment was for next saturday and also there will be a 50 pound visiting charge plus if any repair work or parts to be replaced will be charged extra! 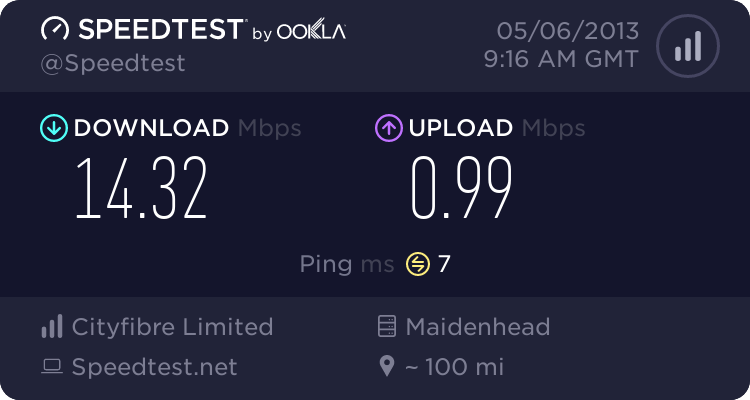 I argued that as speeds were not as advertised (at time of signing up I was told I will get around 7 mbps at my residence at Coventry ( near to city centre!) and they told me that as far as they are concerned at time of installation the line was fine and if any problems happening after that is responsibility of customer and they need to pay!! what a joke! Oh I forgot the technical team also suggested I upgrade to their fiber optic connection as its supposed to be 5x faster and ofcourse will cost more obviously! I think the real reason why speeds are slow is because they are capping it or they have got way too many subscribers and very less bandwidth to share with all and hence the slow speeds and ofcourse they are never going to admit it and will instead play innocent and claim to know nothing about it! anyway if any of you are planning to sign up for their service be warned that you might or might not get the advertised speeds! Next question is whether there are any phone extension and do all phones have a microfilter fitted? That is typical of Talktalk in my experience and they shocked me this very day. I have recently been looking to reduce cost as I spend a lot of time away from this location, but cannot really do that without the dreaded TT oir a TT reseller. I get 13+ Mbps download speed as I have had with all suppliers. Upon helping a friend next door with a printer today, I noticed they had switched to TalkTalk as they were sporting a new router advertising the fact. How is it? I asked ... Cheap but a bit slow was the reply. A speedtest revealed 1.5Mbps - the same as all other examples of TT I have encountered. Market 1 LLU exchange so should not be the dreaded connect service ... Think I will count my blessings and stay put. And remise of the engineer to not do any tests as even with a single socket a wiring fault in the network can cause problems, was this a TalkTalk boost engineer or an Openreach one? As always first port of call is look at the connection statistics from the modem. If the few posters here are the tip of a larger iceberg of slow speeds we would see a large flat section on the ADSL2+ plot, rather than one that mirrors the likely effect of line length versus speed. NOTE Not saying individuals have issues but the overall picture suggests it is limited numbers of people. TTs [business] predictive speed was 38 10 for their "Complete" [80/20] package. Checked with them to make sure I wasn't accidentally being given data for their 40/10 offering but was told this was the lower end of predictive speeds that the line would support on the "complete Package". Won't know of course until the line goes live what the delivered speeds are, but relationship with TT hasn't got off to a good start. Based on this experience, it does indicates to me that the subject heading could be true. OK sounds more like congestion - if it speeds improve after midnight and tail off from about 3pm onwards each day then generally congestion is the cause. TTs [business] predictive speed was 38 10 for their "Complete" [80/20] package. Checked with them to make sure I wasn't accidentally being given data for their 40/10 offering but was told this was the lower end of predictive speeds that the line would support on the "complete Package". Just found someone three doors away on Primus LLU which is resold TT. They are showing 8Mbps at lunchtime to my 13Mbps, with the same slowing in the evening reports, so it seems the usual sell it cheap pile them high that you expect for peanuts, with TT direct the worst of a bad bunch.